A couple of days ago, I read this article on getting up early. Having gotten up 10 a.m. and enjoying my third cup of Saturday coffee, it made perfect sense. If I raced someone, I wanted to win. I'd get up early and would have time to exercise and eat breakfast and contemplate the world. All the things I didn't have time to do during the day. I loved the article so much, I forwarded it to the hubster and in a sickening gung-ho manner, proposed that we get up early from hereon. Except well, I hate getting up early, I don't like exercising, and as hard as it is to believe, I'm not really hungry first thing in the morning. Oh, and my contemplating the world is pretty much centered on how I hate getting up early. But once I proposed the idea, there was no going back. The next morning, sacred Sunday morning reserved for sleeping in and leisurely brunches, the hubster jumped out of bed and started chattering about how getting up early was such a great idea. The normally quiet hubster was talking incessantly... at 6 a.m. I would have appreciated the irony of the situation... if it wasn't 6 a.m.
After I finally dragged myself out of bed, the hubster had the audacity to propose we go to the gym. I resisted the urge to pummel him. Recognizing his life was in danger, he suggested we stretch in the comfort of our living room. This sounded reasonable. Maybe I could catch a short nap while stretching. Until I realized his defintion of stretching and mine clearly didn't coincide. See, stretching my world is me standing there, trying to touch my toes relaxedly and then, well, stopping. The hubster's stretches involved, well work. Finally, I just gave in, and went to my happy place as followed along quietly because it was taking too much energy to complain. The hubster, unaccustomed to a lack of complaining, suspiciously asked, "What are you thinking about?" "Brownies," I replied contentedly. "You are thinking about brownies during our morning stretches?" he asked, shaking his head. "Yup, and not just any brownies. Ad Hoc brownies," I replied. See, my love for Thomas Keller is fairly well documented but I had no idea he was also a brownie genius until I tried an Ad Hoc brownie at Eat the Love's Holiday Dessert Extravaganza. Dense, fudgy, and of course perfectly chocolaty. These are not your grandmother's cake-like brownies. Since that fateful party, I have been plotting as to how I can get those brownies in my stomach again. And to think, Sunday morning stretching hour was just the time I needed to plan my brownie blitz. Needless to say, as soon as the hubster announced stretching time over, I pushed his stretchy self aside, rushed into the kitchen and got my brownie making on. And I am proud to report that I spent the remainder of Sunday eating brownies. It was almost perfect enough to make up for having to get up at 6 a.m. Almost. So the moral here is, I may have to accept that the next time I race someone, they will likely leave me in the dust. And not just because I didn't get up early to train but because I got up early and ate an entire pan of brownies. 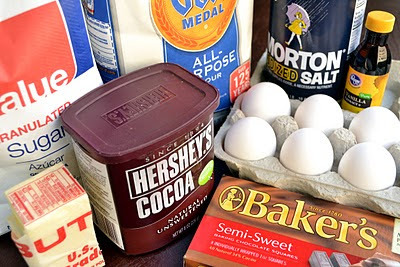 Sift the flour, cocoa powder, and salt into a bowl. Place half of the cubed butter into a bowl. Melt the remaining half of the butter over medium heat in a saucepan. Pour the melted butter over the saved butter in the bowl, stirring to combine. The butter should look creamy, with bits of unmelted butter still present. Beat the eggs and sugar on medium until light and doubled in volume. Add the vanilla. On low speed, alternate adding the flour and the butter in small portions. Finally, stir in the chopped chocolate. Butter and flour a 9x9 square pan. 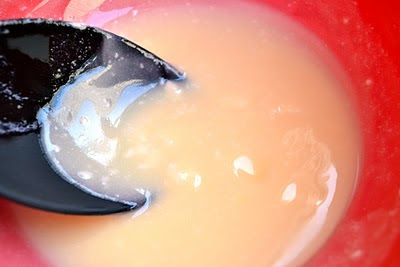 Pour batter into the pan and bake for 40-45 minutes or until a toothpick comes out nearly batter free. Brownies will continue to cook after you pull them out of the oven so you don't want to overcook them in the oven. After cooling, dust with powdered sugar, cut, and serve. Recipe from Thomas Keller's Ad Hoc at Home. Why I have heard so much about this brownies! But every time I see 3 sticks of butter, I just back off. Now its getting difficult. Very. I have been searching for THE brownie. And chocolate is a health food, right? That means it counteracts the butter and sugar. Yum!! And I say eat the brownies... the exercising makes it that much more acceptable! Love your brownies. And love that your hubby got up early and wanted you to do the same. If only every day we could justify productivity by making and then consuming brownies! Yours look outSTANDing, and I am not a baker! I was so on board with that original article until I saw that he doesn't commute. As someone who gets up ridiculously early AND commutes 1.5 hours on the train each way...well, on weekends I am going to sleep in a little. Granted, that's usually no later than 9, so it's not so bad I guess. I am an early riser myself, 630am even on weekends...heck 445am on week days! Lovely baking here. Reading your posts always puts a smile on my face. I'll take brownies over stretching any day. My husband is an early riser and it took a long time for me to embrace the habit. I still do it grudgingly most mornings. I'd get up super early for these brownies, though! You and your hubs sound so sweet together. Have a great week, Azmina! Enjoy your late mornings as long as you can my friend because your own little Maya will have you thinking that sleeping until 6 am is simply...blissful. 3 sticks of butter? Seriously? 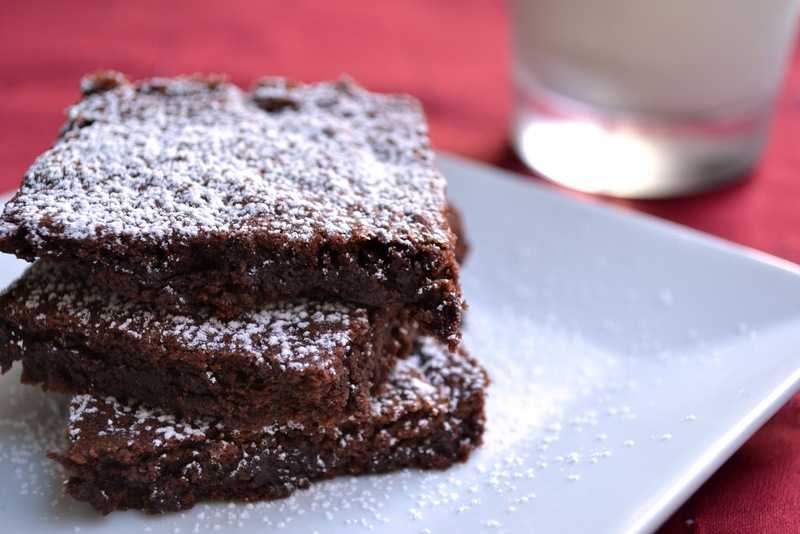 I will be dreaming of these wonderful brownies all.day.long. this post is so funny:) i really hate working out on weekends or any other day..i'll take the brownies anytime! If I had to do anything physical at 6am I'd throw up. Maybe someday you'll get lucky enough to have a Dudette (who can sleep in until 9am even with a 9pm bedtime) instead of a Maya (snicker). Sorry, Ameena. The brownies look heavenly. Even I, the chocolate hater, get a yen for one of these once in a while and they have to be decadent, heavy and gooey. Perfect. We get up early every day. Not by choice. Don't know why anyone would waste a lovely weekend morning to hide in bed. Except maybe for those decadent fudgy brownies. Think I need one right now. These brownies look lovely - no matter what time you make them! I actually love being up early, but I hate getting up early. It's a problem! Will save these for the next time I need a killer dessert to serve to my son-in-law, the chef and Thomas Keller fanatic. These brownies look super soft-I do not dare because of butter that goes into but those pictures are making me weak in the knees! I think three sticks of butter sounds phenomenal and brownies fix everything! Will have to try these soon! Your brownie looks yummy. Yes, I would love this for my breakfast with a cup of coffee. Perfect way to treat yourself for waking up early on a sunday. Those brownies look delicious. i'm dreaming of licking that batter. Three sticks of butter- i'm sure those brownies definitely were blissful. I'm so proud of you for getting up early and getting your brownie making on! I haven't made the Ad Hoc brownies, but there's no question that they're the best - love that cookbook! I'm almost starving when I get up.... and I love exercise... but not when it's forced on me, liking walking up a huge flight of stairs.... Gosh, I have not had brownies in ages. 6am, what were you thinking? I suppose that was a one time thing :-) At least you were inspired by the experience to make brownies! I've been eying this recipe for a while, the preparation method is so unusual with the half cubed, half melted butter. I don't remember the last time I slept in past 10. Maybe 2 years ago. Maybe when I was sick... But I DO know that when I wake up earlier than usual on the weekends I also bake. It's such a lovely thing to do in the morning and these brownies look good. Anyway, I'd rather eat these brownies than win a race any day. 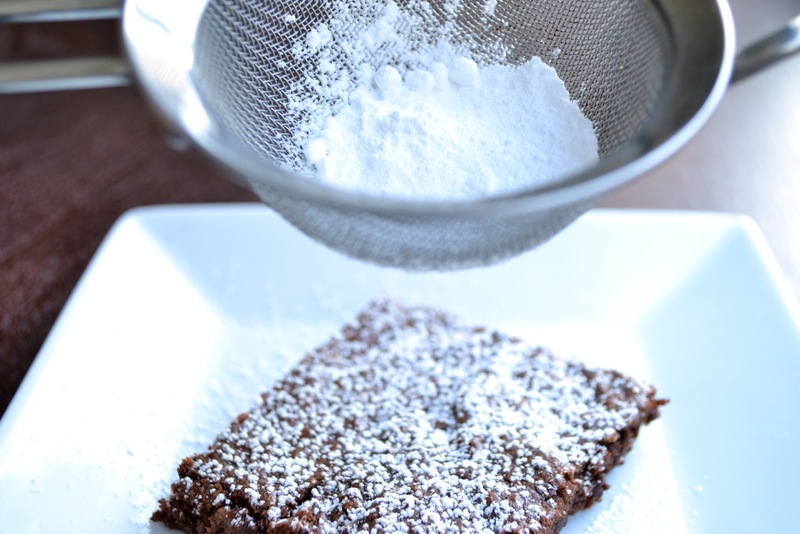 I love Thomas Keller and these brownies look amazing! I'm pretty sure those kinds of brownies make you run faster. Just saying. I think I could eat these just about any time of day! I have been wanting to try a new recipe...and I've found it...right here. These sound so good! I also like the idea of waking up early, but when I try it...no good. Thank you for sharing such an entertaining and delicious post with me. I am totally a morning person so i DO get up early but I get up early to eat and blog and think about food...so not sure how much it counts towards being productive. I love how fudgy delicious these are! These look delicious. I am an early riser. Having to get three kids off to school for years it became a habit. By the way anything you do for more than 21 days becomes a habit. So be careful you don't get up early to many days in a row. Oh my gosh, you are hilarious Azmina. "Maybe i could catch a short nap while stretching". Hahaha! I love your writing style. Thinking of brownies while stretching is classic. Dense brownies are the only brownies I'll eat. These look delicious. how cute is this blog post! love it! Mmmmm! I love the powdered sugar on top! 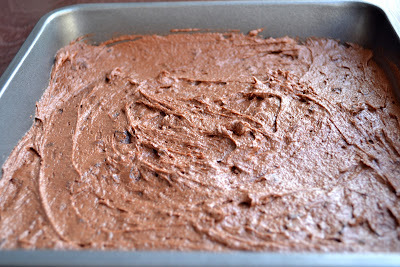 The other day I made some banana brownies for my blog and online cooking show. I'd like to try this recipe too! Sounds like the perfect Sunday afternoon to me! I've made the Ad Hoc brownies and they are definitely one of the top on my list of all time faves!